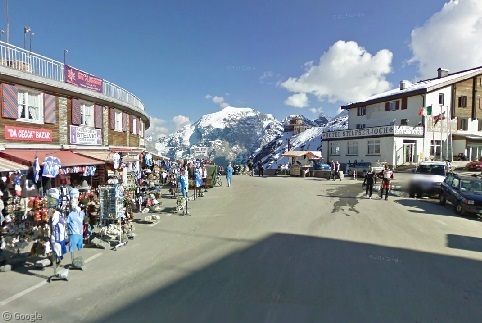 Before we get started, let’s look at a few other notable highest paved roads in Europe. The UK’s highest paved road is the A93 as it crosses the Cairnwell Pass in the Scottish Highlands. 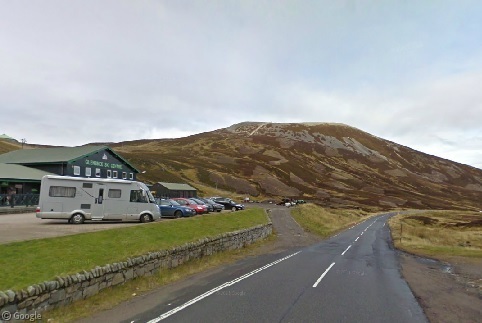 While low in elevation by this list’s standard at 670 m (2,199 ft) above sea level, the pass is nevertheless home to Scotland’s largest ski resort, Glenshee, and the road is often blocked by snow in winter. Northern Europe’s highest paved road is Norway’s Raubergstulsvegen (1,841 m/6,040 ft). 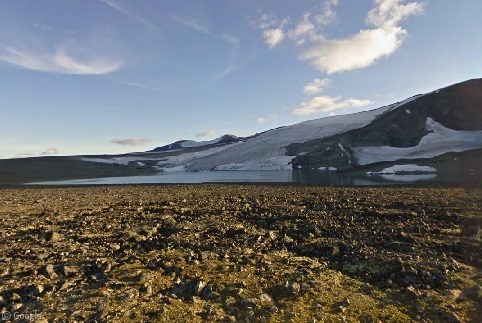 The road leads to the Juvasshytta alpine resort, where summer visitors can see icebergs form in the small lake known as Juvvatnet. 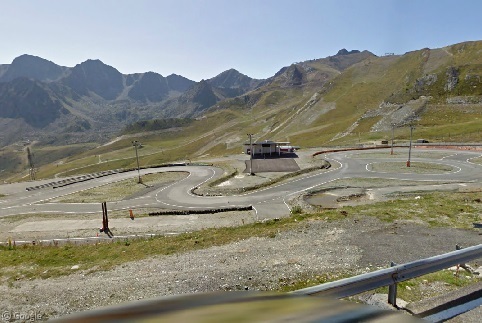 You probably wouldn’t expect the highest pass in the Pyrenees to be host to an auto racing circuit, but that’s exactly what you’ll find at Andorra’s Port d’Envalira, where the Grandvalira Circuit Andorra is just a few metres away from the 2,408 m (7,900 ft) summit. Straddling the border with Italy, the Umbrail Pass hosts the highest paved road in Switzerland (seventh overall) at 2,503 m (8,212 ft). The border is marked by these charming customs buildings. Now to our top five countdown, beginning (naturally) with number five. 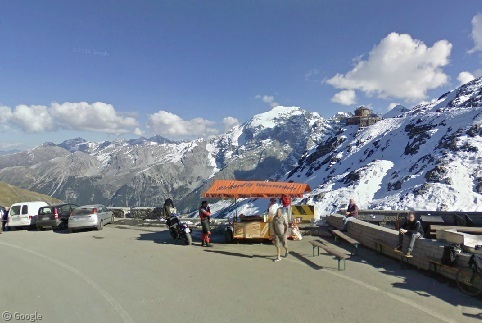 It’s the highest paved road in the Eastern Alps, the Stelvio Pass Road (2,757 m/9,045 ft) on the border between the Italian regions of South Tyrol and Lombardy (and less than five minutes by car from the Umbrail Pass). The pass is the highest point reached by the Giro d’Italia cycling tour (the Cima Coppi) each year (including 2014), and the road has 48 separate hairpin turns. Unlike other locations on this list, the pass is occupied by numerous tourist services, restaurants, stores, and hotels, although there’s still some open space where one can enjoy the scenery (and a bratwurst). 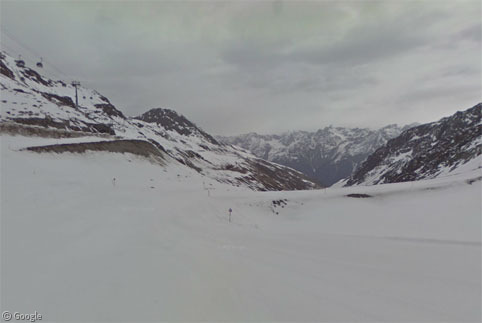 Coming in at number four is the highest paved mountain pass in France, the Col de l’Iseran just south of Val-d’Isère. 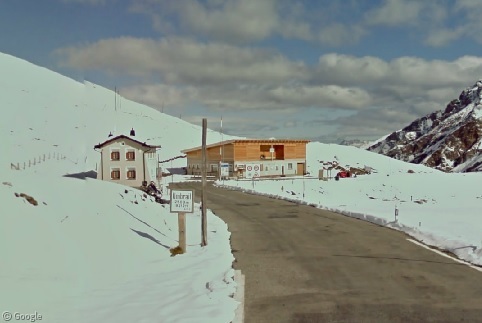 Only a handful of kilometres from the Italian border, the Col de l’Iseran has hosted a Tour de France stage seven times, most recently in 2007. 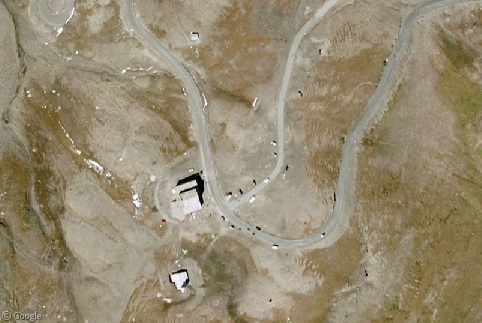 Although paved, the road is only available for traffic during the summer months due to the extreme alpine conditions. 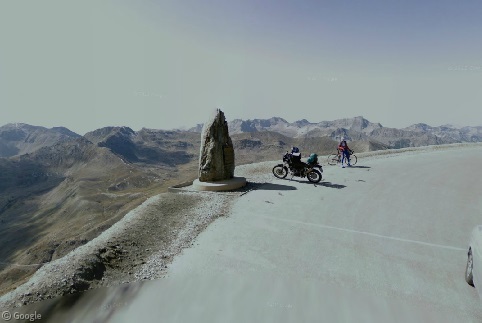 Number three may be also familiar to cycling fans as the highest point reached during the Tour de France, le Cime de la Bonette (2,802 m/9,383 ft), adjacent to the highest pass in the Maritime Alps. The summit of the mountain is a short hike from the roadway and is a spectacular vantage point during years when Le Tour passes by. 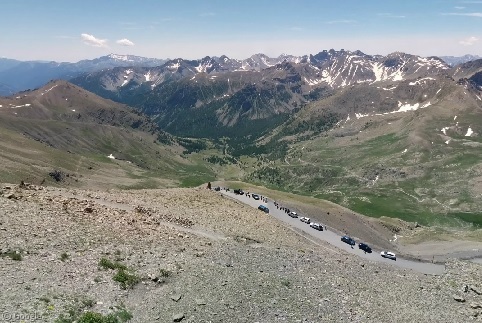 While the race didn’t use this route this year, the road’s high point is still a popular destination each July, as seen by this photo sphere taken just a few weeks ago by Vincent Madelain. 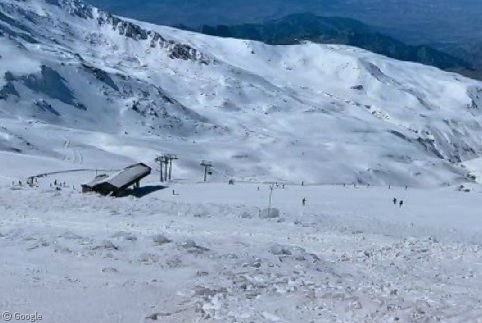 The distinction of being the home to the highest paved road in Europe, however, goes not to a location in the Alps, but to Spain’s Pico del Veleta, the second highest mountain of the Sierra Nevada. 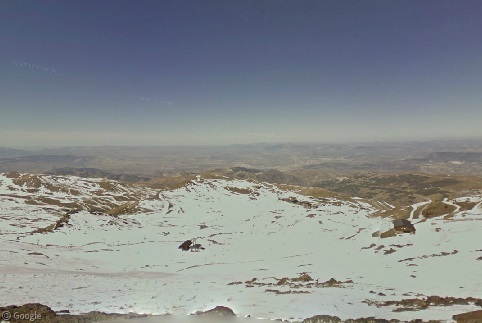 The private access road to the Sierra Nevada Ski Station ends just 10 m (33 ft) below the summit at an altitude of 3,384 m (11,102 ft), and, yes, it’s paved – not that you’d know it from this snowy photo sphere taken by Francisco José, where we see skiers actually skiing over the top of the road as it passes by the highest chairlift. 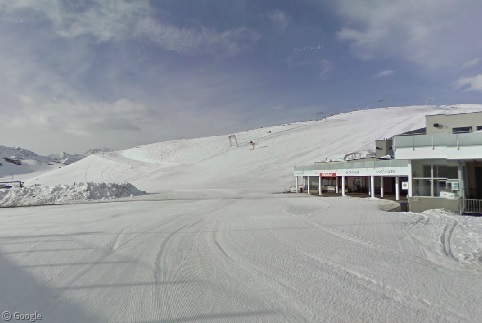 Further down the road, the wintry mountain conditions of the ski resort contrast heavily with the arid Mediterranean climes below.